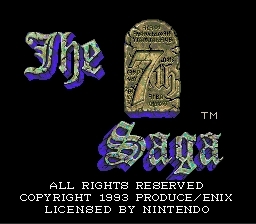 This game, known to those of us of the U.S. as The 7th Saga, is at the same time both your typical RPG, and not. It is typical in the fact that you, of course, end up fighting over the fate of the world… It isn’t in the sense that the people you call companions one minute, can be battled and defeated the next. You are one of a group of people trained by a wise and strong King, sent forth to find the Runes scattered across the world. Each one of these has a specific power, some of which can be used in battle. They also show up specifically in your mini-map when you’re near one. You can play as a Human, Demon, Alien, Elf, or a strange Tetujin… a robotic like creature that looks like Robocop on steroids. Lots of fun little storyline ploppers to run across. If you’re a fan of RPGs, you’ll more than likely love it, at the very least enjoy it and the crew of available characters for awhile. I sure did.